In Making Small Groups Work, Cloud, Donahue, and Townsend provide four sixty-minute sessions to train leaders and group members in the foundational values and practices of becoming a life-changing community. These sixty-minute sessions are the foundations of small groups that include teaching by the authors, creative segments, and activities and discussion time. * Session 1 provides a foundational experience that helps group members get excited about the adventure and life-changing power of small group life. * Session 2 focuses on introducing values, ground rules, and logistical issues to deepen relationships. * Session 3 unpacks each of the five key values through in-depth teaching and practical examples. * Session 4 transitions the group to running on its own, using a variety of exercises to help the group clarify what their focus will be, and what they want to do in their next meeting. Making Small Groups Work helps leaders to create strong relationships and promote the kind of in-depth discussion that will help everyone grow in their spirituality. 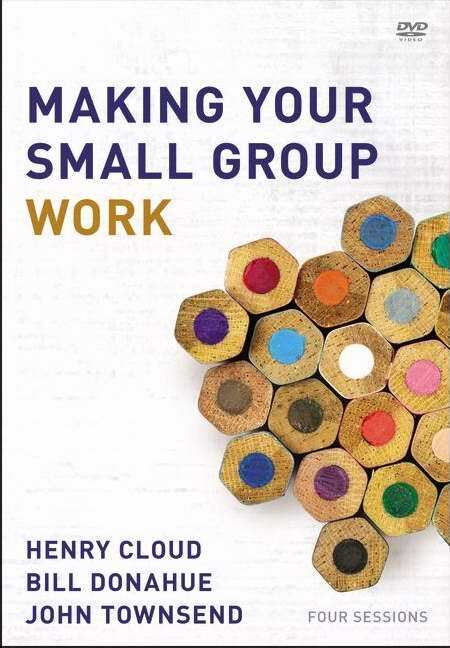 Making Your Small Group Work DVD by Bill Donahue; Henry Cloud; John Townsend was published by Zondervan in May 2012 and is our 42235th best seller. The ISBN for Making Your Small Group Work DVD is 9780310687467. Be the first to review Making Your Small Group Work DVD! Got a question? No problem! Just click here to ask us about Making Your Small Group Work DVD.